Phenoxy PK™ FE by Gabriel Chemical is a tough, ductile, amorphous, high viscosity phenoxy resin (polyhydroxyether). It exhibits excellent thermal stability, good adhesive strength and moisture vapor barrier properties. It can be crosslinked by reacting its hydroxyl functional groups with isocyanates, melamine resins and phenolic resins. It is soluble in many polar and aprotic solvents such as MEK, cyclohexanone, and glycol ethers. 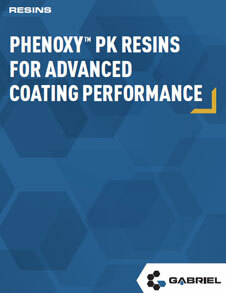 Phenoxy PK™ FE is recommended for thermoset coatings, single pack epoxy coatings, inks and paints. It complies with TSCA, DSL, PICCS, AICS, ENCS/MITI and IECSC regulations. It meets 21 CFR 175.300 US FDA requirements for use in food contact and packaging applications.